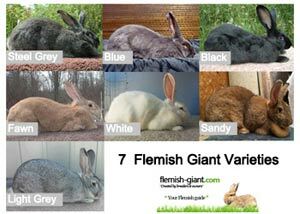 During our years of experience with raising Flemish Giants, we have discovered that there are few things that are as frustrating as having questions and not being able to find straight forward, easy to understand answers to the many questions that have arisen. For this reason, we are providing our readers a comprehensive, wide variety of Frequently Asked Questions, in which we will break down into sections that are not only easy to understand, but also easy to locate. For example, if you have a question about feeding, you can go to the FAQ section of that topic. Likewise, if you are wanting to learn or have questions about breeding, or showing, grooming, needing housing advise, you can click on that topic and not have to weed thru a series of un-related Q&A’s to find the answers that you are in need of. Furthermore, to assist you in finding basic care information, please see the list questions and answers below. Do you have Flemish questions? Our FAQ section will help you out! 1) How do I brush my giants fur? a) Place your Flemish on a solid, sturdy surface. Using any type of pet-brush or comb, begin at the base of the shoulders, lightly brush back and over his rump. Repeat the procedure, from the center of his back, until you have completed going over this entire body. If there are area’s that seem to have more loose fur, you may wish to go over those spots more than once. Also note that rabbits do not like to have their feet or faces brushed, so if you are attempting this – do so with caution. 2) How do I clip my Flemish Giants toenails? a) Clipping nails correctly requires a bit of practice, but is not difficult to do. You will first need to lay your bunny on his back. (Watch out for those hind-feet, if he get scared you may get kicked and/or scratched.) Now, gently press the pad of your finger into the pad of his foot. This causes the toenails to be easier seen and worked with. You will see a distinct pink line inside the nail. That is a blood vessel, and if cut, it will bleed. So you want to put the edge of the clippers in front of that line; then simply cut close the clippers around it, as you would if you were cutting your own nails. 3) What do I do if I cut my giants toenails too close, and he starts bleeding? a) Remain calm. This happens more frequently than you would think. All you have to do is apply a dab of Styptic Powder onto the nail and the bleeding will clot very quickly. If you do not have Styptic Powder on hand, no worries – cornstarch or even confectioners’ sugar will do the job. 4) How do I check my rabbits’ teeth? a) While the giant is lying on his back, place your hand in a “c” shape, over his nose. Using your thumb and forefinger, gently lift the upper lip to expose his teeth. The ones that need checked are the front 4, so there is no need to ‘dig around’, and do not insert your fingers into his mouth – you will get bitten. You want to see the top 2 teeth evenly overlapping the bottom 2 teeth, with no gaps and no split or broken edges. 5) How do I examine my bunny’s ears? a) With your Flemish sitting securely and safely on a flat surface, hold the ear in your hand and look down inside as far as you can see. You may need to use your fingers to gently spread about the base section of the ear in order to see better. 6) How much feed should I give my Flemish Giant? a) Most Flemish enthusiasts free-feed their Giants. This means that you provide them with a large bowl, and fill it with high quality pellets. Once you notice how much he is eating per day, you can adjust the amounts as needed. Also, remember to always supply him with an unlimited amount of fresh, high quality hay. If you wish to give him treats, please do so in moderation, and only on the average of 3 times per week. 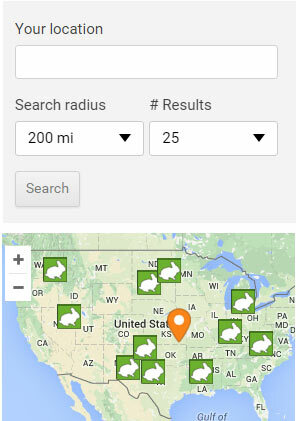 There is a list of rabbit-safe treats provided in the feeding section of this site. 7) How often should I do a basic health exam on my rabbit? a) A basic check should be done every day. Feeding time is a good time to do this. You should look for any physical or personality changes; such as noticing if he has eaten his usual amount of food and drinking his water as normal. Also, pay attention to his actions. If he is not moving around like normal, or if he is grinding his teeth or acting otherwise out of character, you should then remove him from his pen and do a more thorough check, right then. If there is a problem, the faster it is noticed and treated, the better the outcome will be.